Why is reading a Shakespeare so difficult? First and foremost, one of the reasons why reading a Shakespearean play challenges students is because these texts were not really meant to be read – they were meant to be performed. Unlike reading a novel or a short story, reading a play requires us to stage the play in our mind. All Shakespeare provides is the dialogue; we have to clothe the words in how the character might speak the lines, what gestures they might make, or even how they would dress. To read a play means that you take on the job of the actor, director, costume designer, and set designer. Bottom: I will discharge it in either your straw-color beard…or your French-crown-color beard, your perfect yellow. Quince: Some of your French crowns have no hair at all, and they you will play barefac’d. Helena: Call you me fair? That fair again unsay. Allow me to translate: You are calling me fair? Take that back because Demetrius loves your beauty. Your eyes are like guiding stars and your voice has a more pleasing tune than that of lark singing to a shepherd in springtime. Now, you may ask, “Well, why doesn’t Shakespeare just have Helena say that?” My response, as pitiful as it may be, is that Shakespeare is not read for plot but for the beauty of his language. As Twenty-first Century readers, we generally read for plot, what Margaret Atwood would call, “a what and a what and a what.” The plots of Shakespeare’s plays are not what he is revered for. 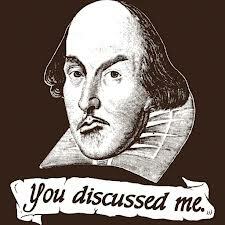 (In fact, Shakespeare stole his plots from other authors. Only for four of his plays does he come up with his own plots. Can you guess one of them? [Click on this hyperlink for the answer.]) Not too sound pretentious, but it is the beauty of his poetic language that made him immortal. So how do you go about reading a Shakespeare play? Start by accepting the fact that you will have to read a line, a speech, a scene, an act, or the entire play more than once. If you rush through reading Midsummer, you will end up more confused about what is going on in the play than not. I recommend that the first time reading through the play should be for plot – figure out what happens in each scene. You might even want to outline the plot for yourself scene by scene. Midsummer has 18 speaking parts. To complicate matters the two pairs of lovers (Hermia, Lysander, Helena and Demetrius) form the central plot are easily confused. In Act III, thanks to Puck’s mischievousness, which man is in love with which woman is switch. In addition to outlining the plot of the play, you may find it helpful to map out the characters as well – what is his/her relation to others in the play.